The discounted AAAE room rate is $279 single/double occupancy plus applicable taxes at both properties. The last day to receive this discounted rate is Friday, March 23, 2018. Rooms may sell out before this date, so make your reservations early! Payment for the first night's room and tax is required to guarantee a reservation. Check-in is at 3 p.m. and check-out is at 12 p.m. Cancellations made at least 48 hours prior to arrival date will be eligible for a refund of the deposit. Early departures are subject to a one night room and tax charge unless the hotel receives notification at the time of check-in. Book your reservation online. PLEASE NOTE, THE HILTON IS SOLD OUT ON THE NIGHTS OF SATURDAY, APRIL 14 AND TUESDAY, APRIL 17. Check-in is at 3 p.m. and check-out is at 12 p.m. Cancellations made at least one week prior to arrival date will be eligible for a refund of the deposit. Early departures are subject to a two night's room and tax charge unless the hotel receives notification at the time of check-in. Book your reservation online. PLEASE NOTE, THE OMNI IS SOLD OUT ON THE NIGHT OF SATURDAY, APRIL 14. For further information about hotel reservations, contact Natalie Fleet, AAAE, at 703.578.2505 or email natalie.fleet@aaae.org. All meetings will take place at the San Diego Convention Center. Note: Please note that there are several companies (National Travel Association, Global Housing Services, Corp., Exhibition Housing Services, CBS International Inc. Ehoteliers, Global Travel Partners, etc.) who may contact AAAE attendees and exhibitors claiming they are calling on behalf of AAAE and are the official housing company for the conference. 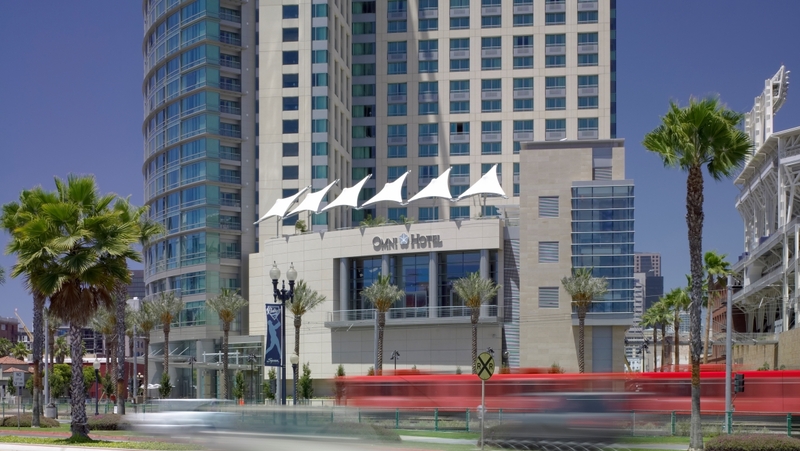 The only way to make reservations within the AAAE block and to receive the discounted rate at the Hilton San Diego Bayfront or the Omni San Diego Hotel is to make your reservation directly with the hotel. AAAE does not contract with third parties to make hotel reservations, and you should only be providing your credit card information directly to employees of the hotel. Always ask about the AAAE block rate when making your reservation with the hotel. Reservations made with unauthorized third party companies are not valid reservations. In the event that you book rooms through any such organization, AAAE will not be able to assist you should rooms be unavailable upon your arrival at the hotel. Should you receive any of these calls or have any questions, please contact Natalie Fleet, AAAE, at 703.578.2505 or email natalie.fleet@aaae.org.